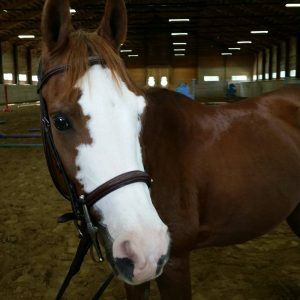 Kip is a 6 year old gelding. 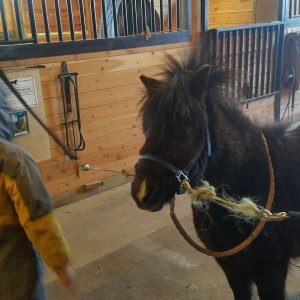 He is 13 hh and is our smallest lesson pony. Kip is excited about show season and showing off his flashy trot (in another life he was a driving pony!) He is used intermediate and up riders. 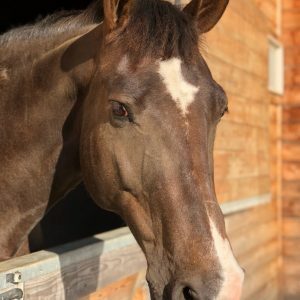 Harvey is a 14 year old 16.1 hh Irish Sport Horse gelding. Born in Ireland and imported, he is an Irish gentleman who will teach you the ins and outs of jumping. He has automatic changes. 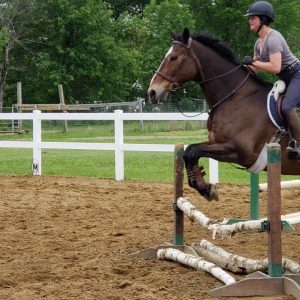 He is that special horse that can be ridden by beginners up through our advanced riders. Pirate is a 12 year old mini that is blind in one eye. He is our SeaHorse mini, camp buddy and escape artist! Monty is a 16hh 17 year old appendix gelding. He is a sensitive soul, patient teacher who loves to horse show. Monty has a flying change, jumps up to 2ft 6 inches and is the most energetic horse in the field. Cricket is a Florida native but is adjusting well to Maine’s cold winter. She is the calmest 5 year old poney we have ever met. 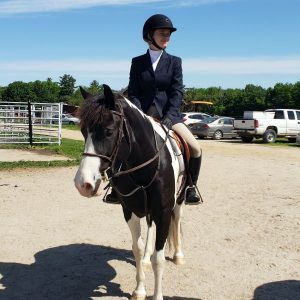 Cricket is a Gypsy Vanner cross, and even though she is only 14hh, she can take a tall rider. Dandy is a 23 year old Arabian gelding. 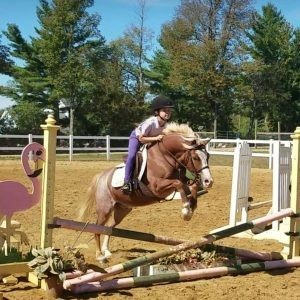 Fine and Dandy is known throughout the state of Maine and has spent many years gracing the show ring with short- stirrup riders. He has automatic changes. He is in semi-retirement and is only used for our beginners. Dottie is a 24 year old Appaloosa mare. Dottie is our therapeutic riding horse and has a fabulous walk. She LOVES being brushed and getting treats.